Dipoli is one of the premier venues in Finland for meetings, seminars, international congresses and festive events. It is in a prime location, sharing in the diverse services on offer in the capital as well as the innovative atmosphere of the scientific community of Otaniemi. Dipoli building is one of the landmarks of Finnish archidecture. In the early 1960s, a design contest was held for what would become the new building for the Student Union of newly built Helsinki University of Technology. 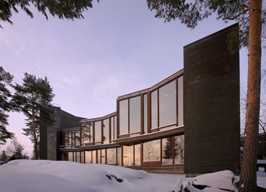 The contest was won by Reima and Raili Pietilä, and their 1961 design was used as the blueprint for the Dipoli building. Work began in 1965, and the building was ready for use in the fall of 1966. The name is a pun; it can mean dipole, but also "the second Poli", the second building of the polytechnic students. In 1993 the building was transformed into a training centre of the university. Dipoli is regularly used for conventions, congresses and student parties. The building houses over 20 conference rooms and auditoriums.